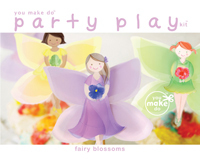 Make a fairy party, with fairy blossoms party printables from you make do. This wondrous fairy party printable kit is filled with imaginative, easy-to-assemble decorations you print and make. Create a playful and magical celebration day, to make it a remember-for-always one. Print as many as you need. ✿ a template to make blossoms for fairy wands and necklaces. All for a sweet celebration your special guests will remember with wondrous awe. fairy blossom necklaces We printed our blossom templates onto pastel paper�pink, yellow, and white. We made blossoms with our kit templates, then strung them onto varying colors of 1/8" satin ribbon, long enough for the necklaces to slip over the little guests' heads. We hung the necklaces on a branch, for the children to select their favorite to wear, when they arrived at the party. fairy cupcakes We baked our favorite cupcake recipe�topped with a fluffy buttercream�to make our fairy cupcakes. Unique party idea�we used overturned vintage tea cups, adorned with pretty blossoms, to place our fairy cupcakes upon. paper flower trail Print many pages of blossom templates onto pastel papers (we used pink and white). Sprinkle the paper blossoms in a trail up the walkway, into the celebration area, and on the table around the cupcakes. flower straw toppers Extra flower straw topper blossoms can be printed and strung on ribbon for another pretty paper flower garland. We used ours over the party food table. fairy wands After printing the blossom template on pastel papers and stringing them on 1/8" ribbon, we tied them to wand-length sticks. Dowels could also be used (painted or unpainted). The children couldn't help dancing�like fairies�with their filled-with-imagination magic wands. fairy printables for fairy pretend play too! Make fairy puppets Attach popsicle sticks to the fairy cupcake topper printables for imaginative dramatic play. Make fairy dress-up play Use the blossom templates to make blossom necklaces and fairy wands for pretend play. Make a fairy tea party Use the flower straw toppers to make tea party table bouquets or a pretend fairy garden for play. Use the blossom garlands to use as fairy tea party decorations or to create a fairy land inside�or outside, hanging from tree branches. Decorate childrens' rooms Hang garlands above bed. Insert blossom straw toppers onto dowels and place in vases or jars for pretty paper bouquets atop a dresser or side table. Make a pretty fairy party to make a lasting birthday memory for your young one. This full-of-imagination kit was made by the mother of a few, New York Times bestselling illustrator Heather Cahoon, to add simplicity and delight to your special celebration. This kit is simple enough for young ones to join in the party planning fun. Make memories creating your next celebration together. Skip and hop to wordplayhouse.com for more creative play ideas. 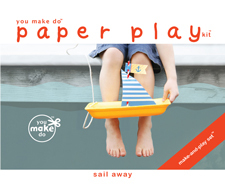 Share in the marvel of play with our growing treasury of paper play books and printables. Cherish them all.